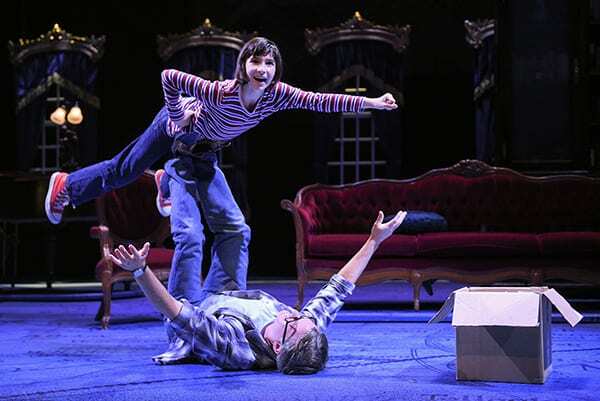 A scene from the musical Fun Home shows the set design of SJSU Assistant Professor Andrea Bechert. Andrea Bechert, an assistant professor and designer in the Department of Film and Theatre, will have her scenic design on display during an October run of the Tony Award-winning Best Musical Fun Home at the Mountain View Center for Performing Arts. The show, presented by TheatreWorks Silicon Valley, is based on MacArthur Fellow Alison Bechdel’s graphic novel that details her experience growing up in a loving yet dysfunctional family that owns a funeral home. The set design was an especially challenging project as the storyline is based on Bechdel’s memories—it moves back and forth between the author’s childhood, college years and present life—sometimes with three actresses playing Alison at different ages on stage at once. Rather than building fully realist sets, she played with filing the stage with elements to suggest a home, such as a couch, a chair, with windowpanes and curtains in the background. Bechert talked about her work on Fun Home in a recent San Jose Mercury News article, and noted that she felt an especially personal connection to Bechdel’s story. Fun Home will be presented October 3 – October 28 at Mountain View Center for the Performing Arts, 500 Castro Street, Mountain View. For more information, visit TheatreWorks.org.